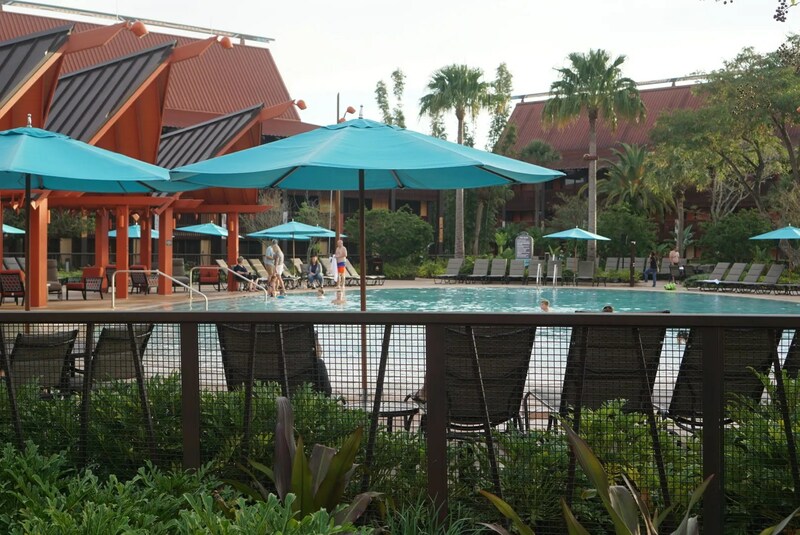 If you read my last report you know that I stayed at 3 resorts (Boardwalk, Polynesian, and Animal Kingdom Lodge) during my 14 night trip in 2017. 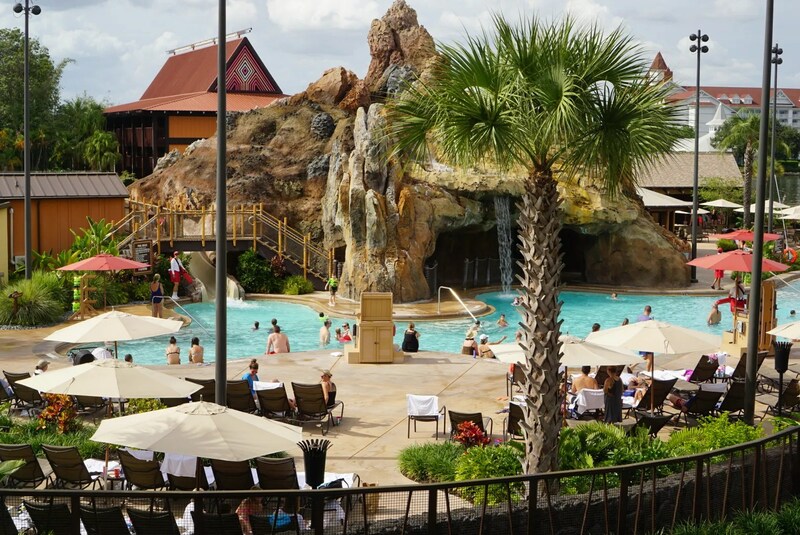 And if you read my report you also know that I was disappointed with the Polynesian for various reasons. A few of these were the “dingy” condition of the public areas of the Rarotonga longhouse where I stayed and the less than ideal layout of my room (especially the bathroom area). 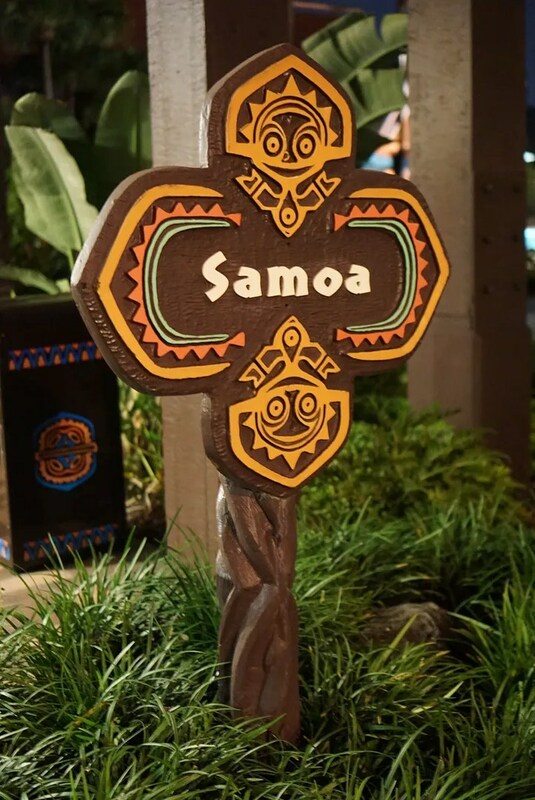 So when planning this trip with my travel agent, the Polynesian was not even on my wish list of possible Magic Kingdom resorts at which to stay. But then neither the Contemporary or the Grand Floridian were available (with their travel agency discount) for the first 5 nights of my trip (when I wanted to stay in the MK area). 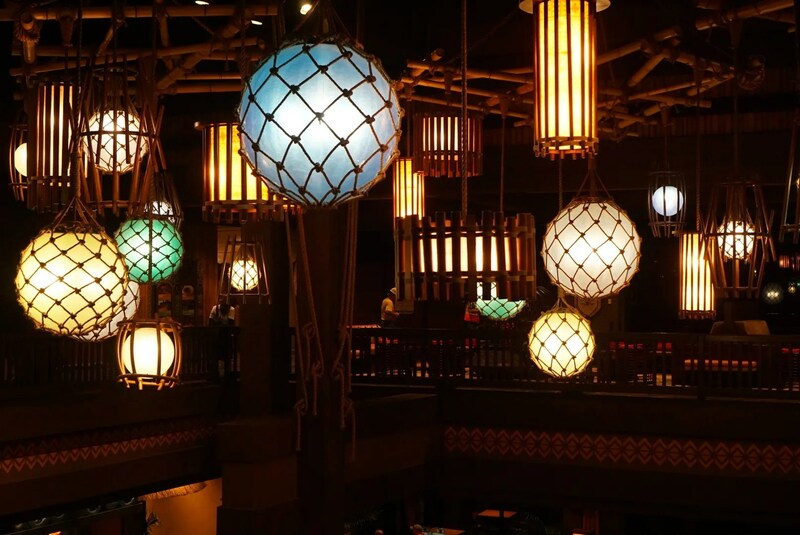 The Wilderness Lodge only had availability for the last 2 of the 5 nights. 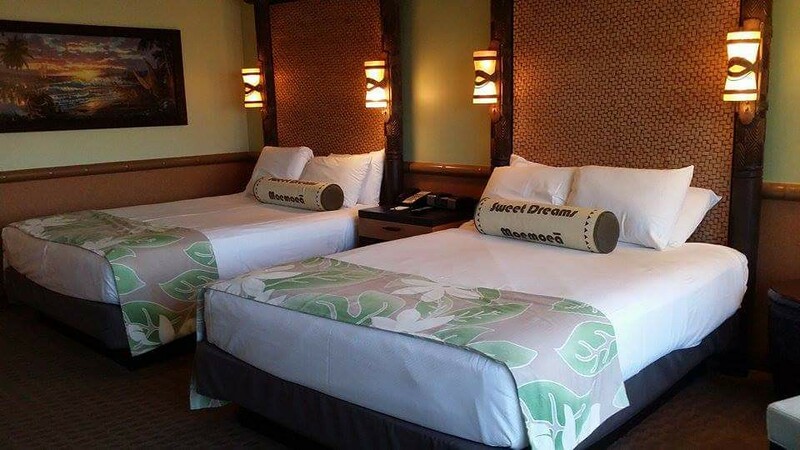 So that left only the Polynesian, which was available for all 5 nights with a good discount, though I opted to stay there for the first 3 and then switch to the Wilderness for the 2 nights it was available at a discount. 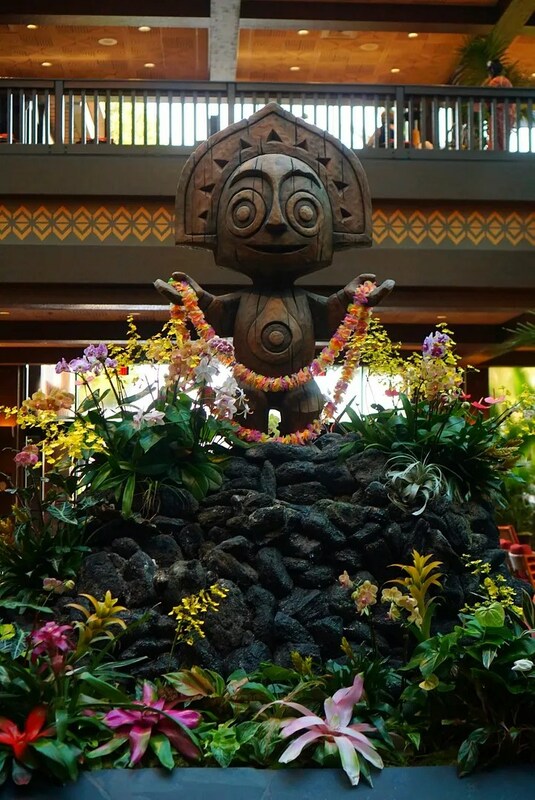 And so it was with guarded optimism that I entered the lobby door of the Polynesian Village Resort on the first day of my 2018 trip. 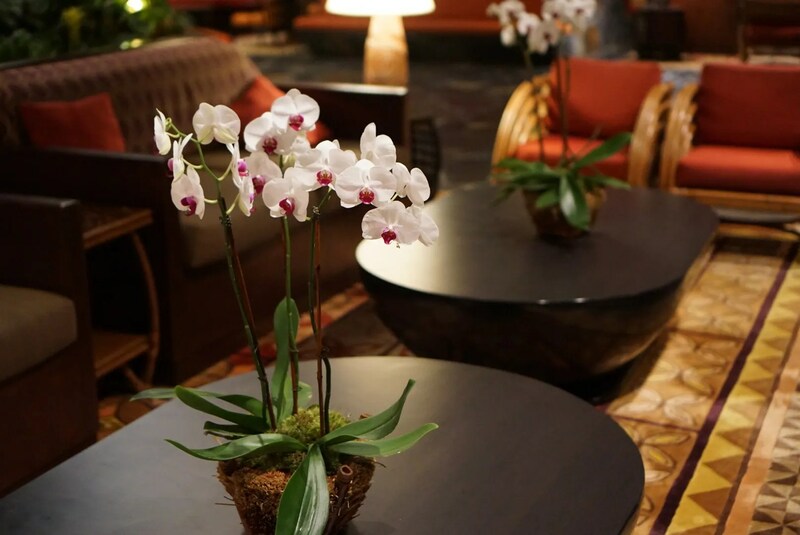 While there are always flowers in the lobbies of the Disney resorts, I don’t recall seeing so many and I don’t remember them being orchids before. 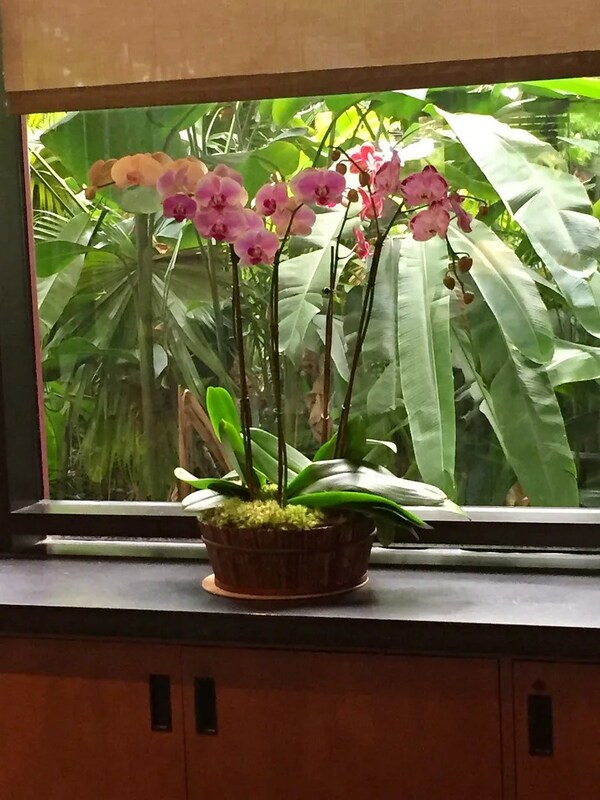 Since orchids are one of my favorite flowers, I was very happy to see them whenever I walked through the lobby. However, one time while passing by I overheard the bartender tell a guest that they had other drinks available. On the first night (and I believe the second night too) I passed by on my way to the monorail and this area was full of people. 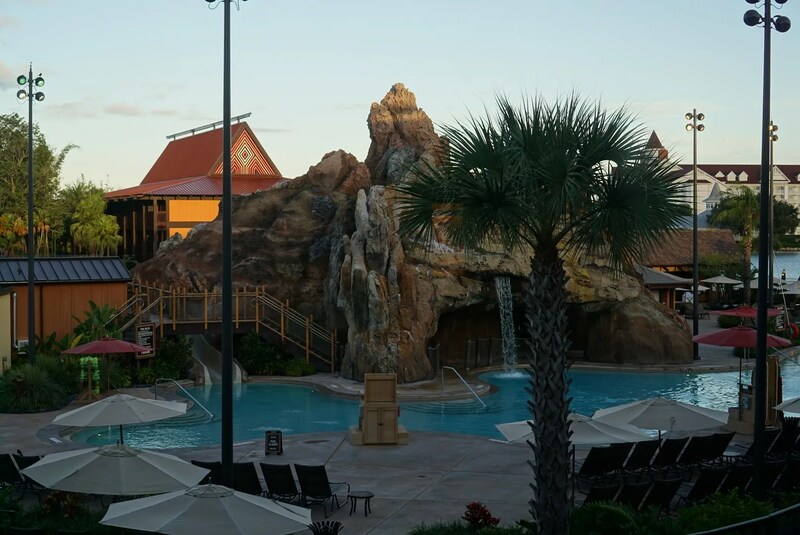 I learned that this area hosts the Polynesian’s portion of the Highway in the Sky Dine Around, a progressive dinner which takes place at the three monorail resorts. It begins and ends at the Contemporary but in between stops at the Polynesian for appetizers and cocktails and at Citricos at the Grand Floridian for the entrée course. 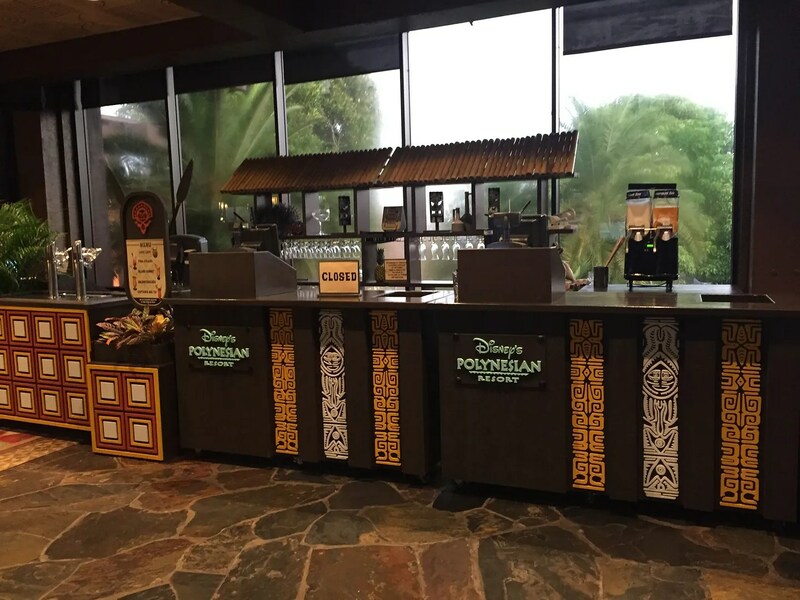 This was something that I had originally planned to do when I discovered that I would be staying at the Polynesian but then when I decided to try out the Disney Dining Plan I dropped it from my plans. With it being $170 plus tax and not being Dining Plan eligible, it no longer made sense to include this out of pocket expense and all of it’s food in my already full dining schedule. But it’s something that is definitely on my list of new Disney dining experiences I’d like to try so maybe next year?? 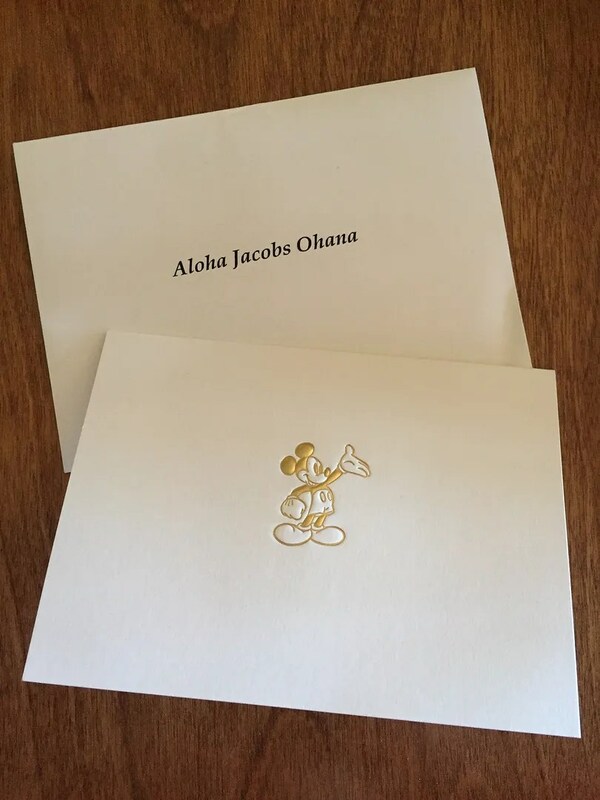 Gone are the old favorites of many guests, including me. 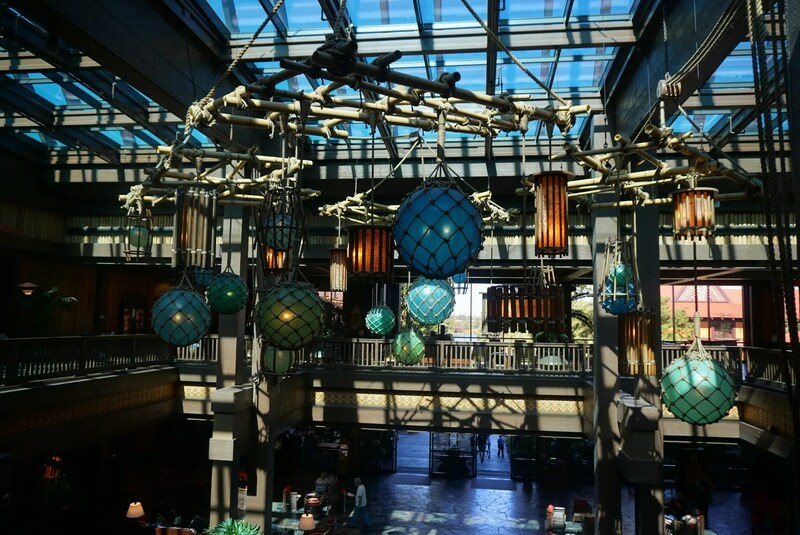 Favorites like the wings, pot stickers, and bread pudding that are served next door at ‘Ohana. 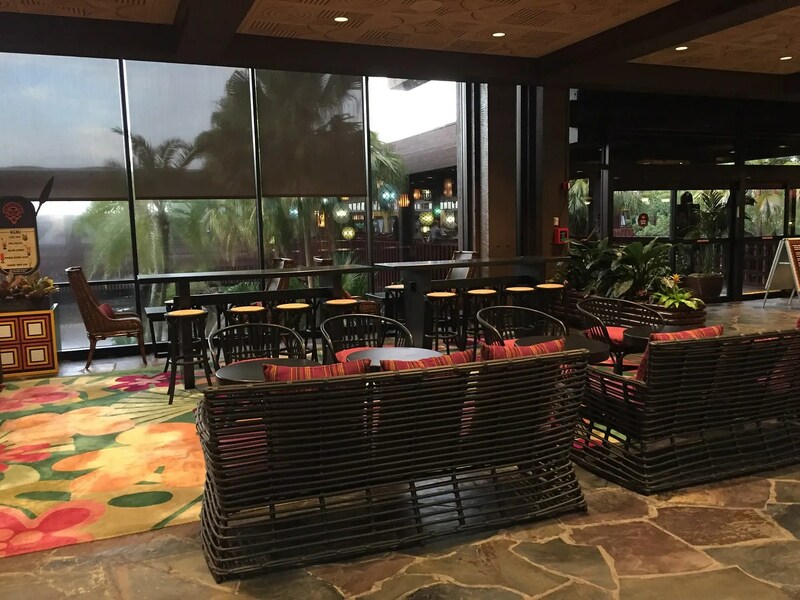 Also the pulled pork nachos are missing, which I myself have only had downstairs at Captain Cook’s (the Polynesian’s quick service restaurant) but they seem to have also been a fan favorite of the lounge. 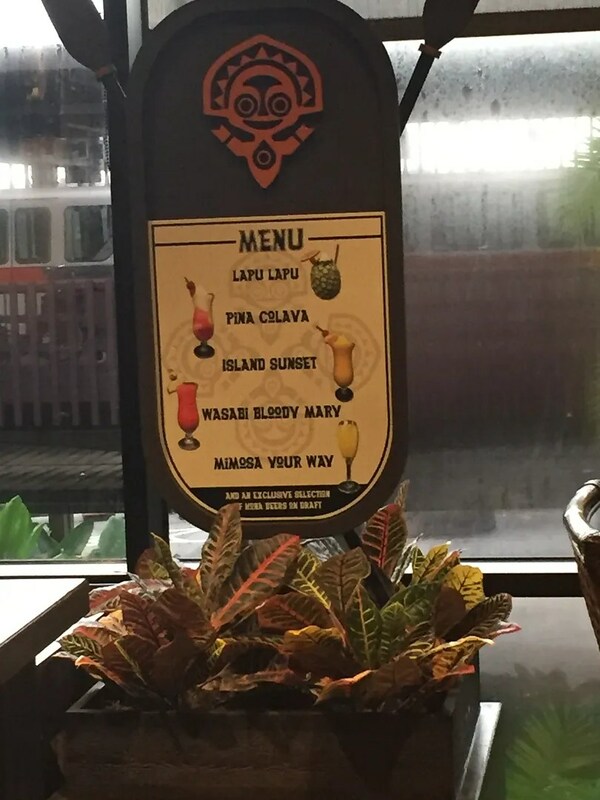 I’ve read two articles regarding the new Tambu Lounge menu and they contained some conflicting information regarding the missing favorites. 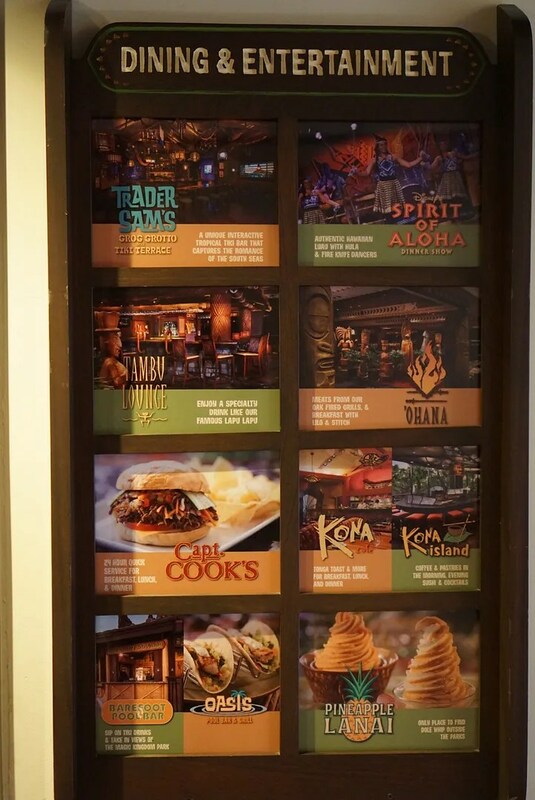 While they both said that though the ‘Ohana appetizers and bread pudding dessert were not listed on the new menu they were still available to order there. However, one source said the popular pork nachos were also still available but the other said they were not. 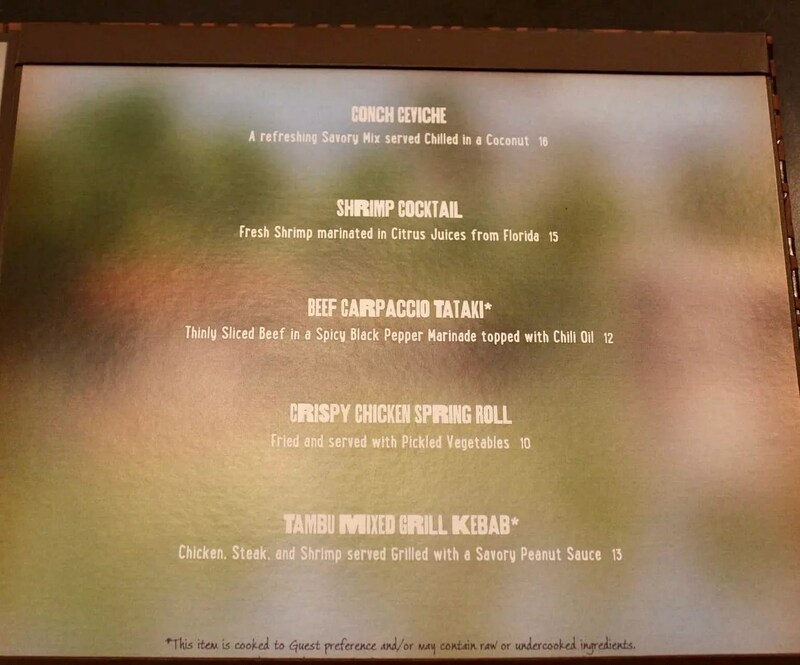 It was also noted by a commenter on this article that, while the pork nachos are available at Captain Cook’s, they are not the same (not as good) as those which used to be served at Tambu. So for those Tambu nacho lovers out there, I hope Source A was right and not Source B. 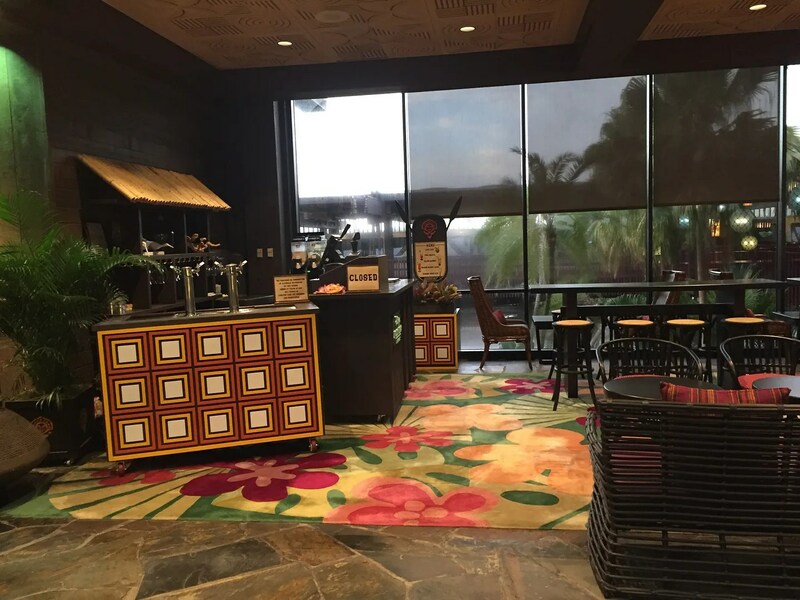 Also of note in one of the articles I read is that while the first temporary bar (the one by ‘Ohana) had been removed upon the reopening of the Tambu Lounge, the second one (by the door to the monorail) was still standing and open. 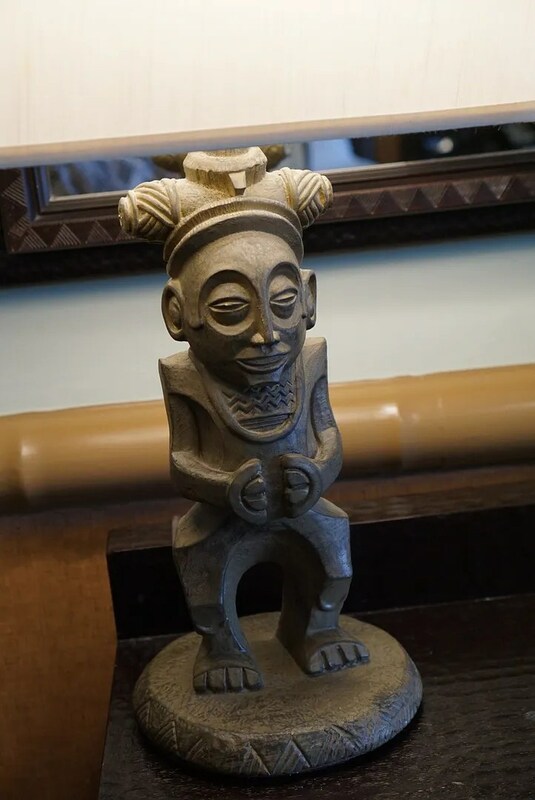 I wish I could have gotten to more of these but with only a 3 night stay here this time I’ll only be reviewing Captain Cook’s and Kona Café for breakfast, Trader Sam’s Tiki Terrace for an appetizer and cocktail, and of course, Pineapple Lanai. I did also take some photos of the breakfast pastries at Kona Island. 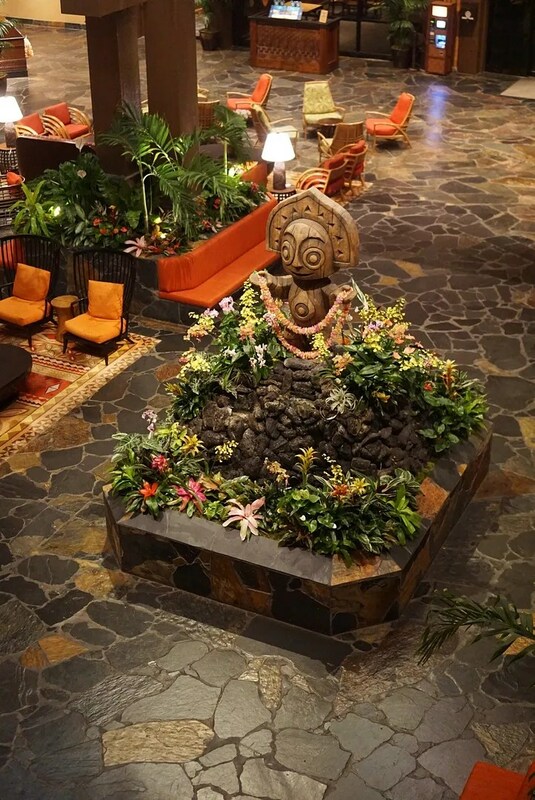 They actually looked better to me than those available downstairs at Captain Cook’s but unfortunately I didn’t discover this until my last morning at the Polynesian, right after I’d eaten breakfast next door at Kona Café. The Samoa longhouse is located pretty much in the middle of the resort. All the rooms on both sides of the building are considered Standard View. And here is the tikiman’s explanation of his map: The buildings in RED are Club Level (aka King Kamehameha Club) Longhouses. 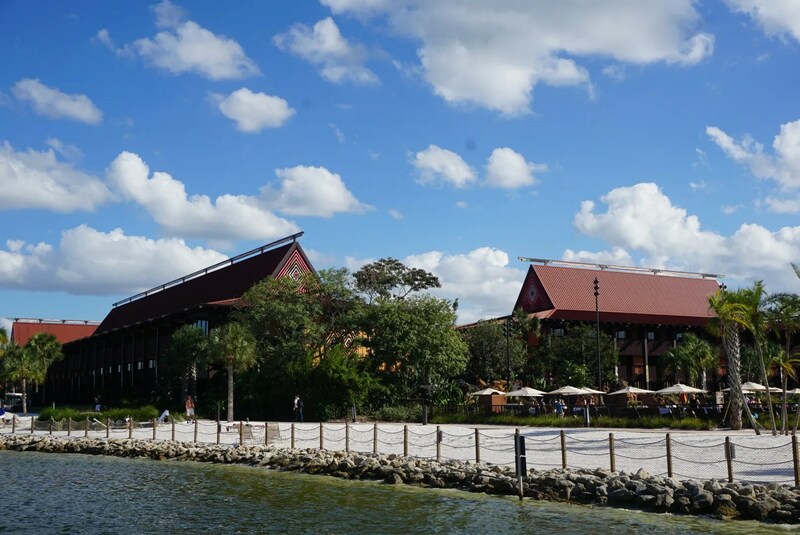 The buildings that are half BLUE and half GREEN are Longhouses with Lagoon View and Magic Kingdom View rooms on the lagoon (BLUE) side and Standard View on the opposite side. 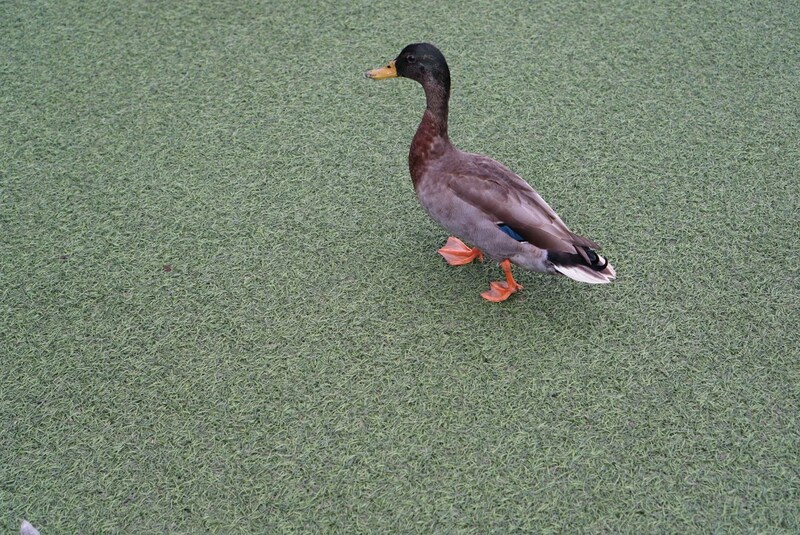 Only Aotearoa has some Standard view rooms on the lagoon side because the view is blocked. 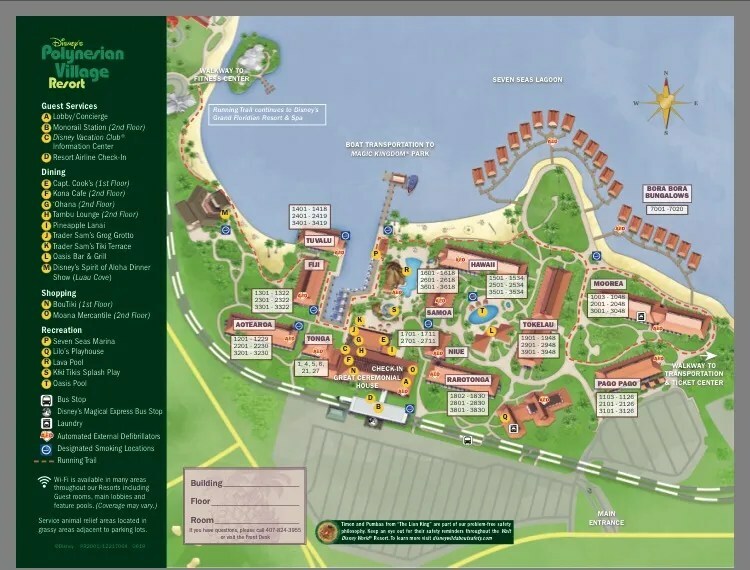 The buildings in GREEN are buildings with Standard View rooms only. 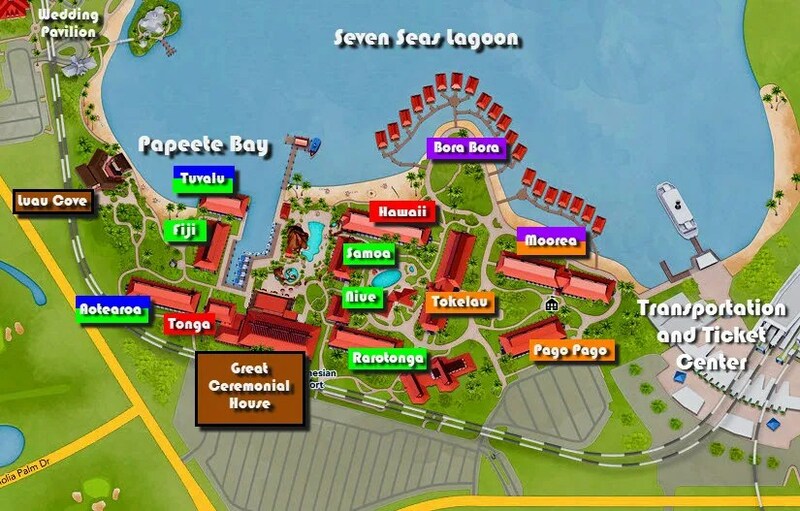 And the ORANGE longhouses are DVC Villas with Standard views and PURPLE designates DVC villas with Lake view rooms. 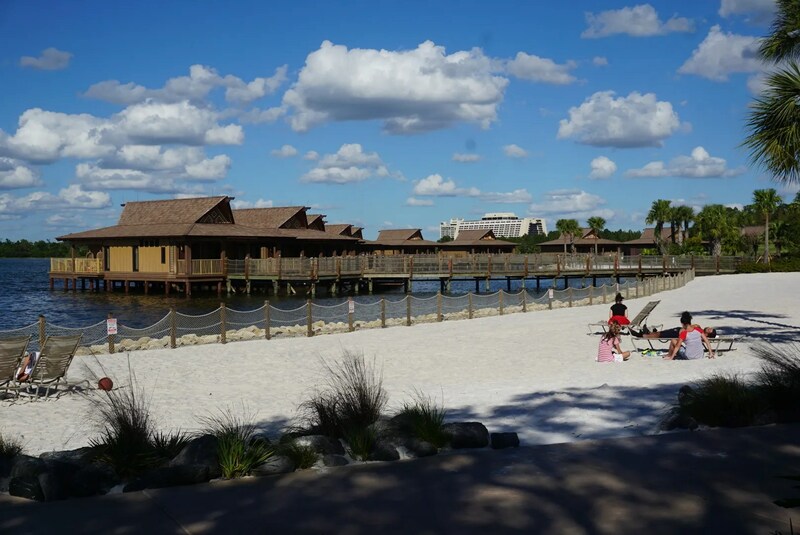 Although I suppose it’s possible for a non-DVC member to rent one of these bungalows (however DVC members have first dibs and it looks like there’s only about 20 of them so probably unlikely), at a minimum price of $2750 per night I’m guessing it would be cheaper to rent a bungalow along the beach of the real island of Bora Bora, lol. 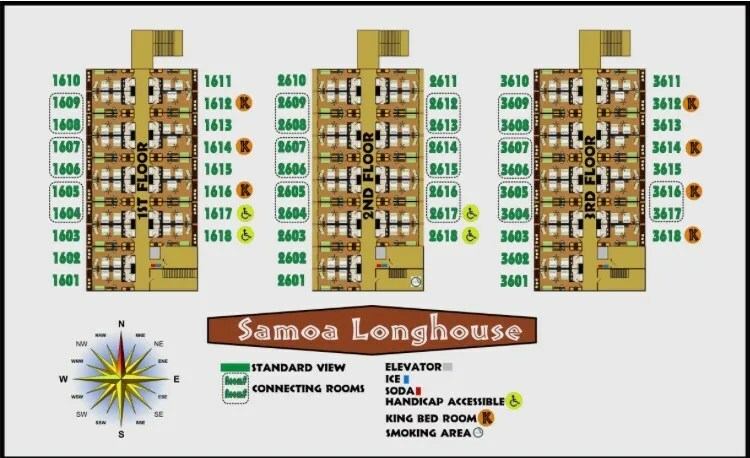 Because, as you may have noticed from the map, the Samoa longhouse is located in between the resort’s two swimming pools. 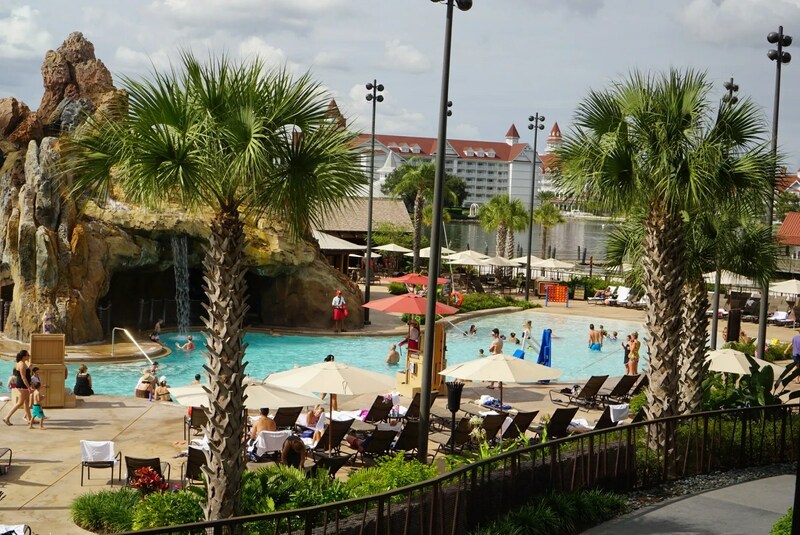 With rooms ending in 01 – 10 being on the side of the Lava Pool (the resort’s main swimming pool). 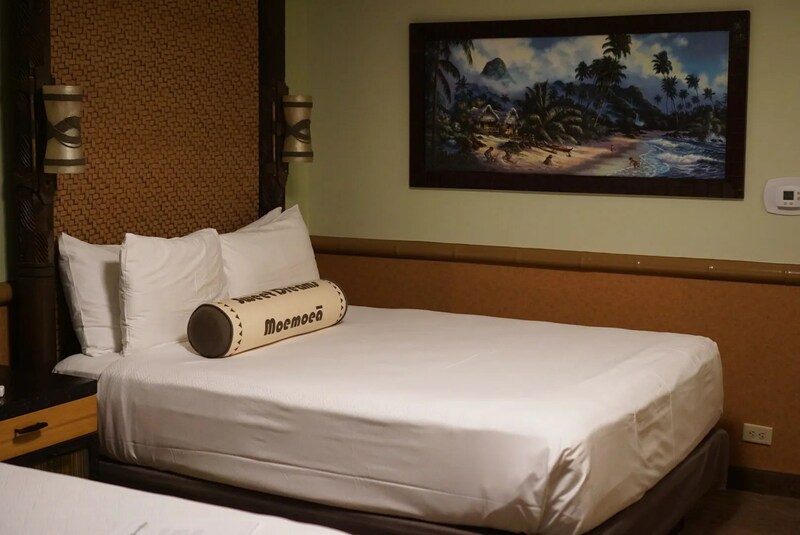 I was happy that I was assigned to Room 2603 because I loved my view of the Lava Pool plus I had the bonus of my room being located just a few steps from the elevator on the 2nd floor. 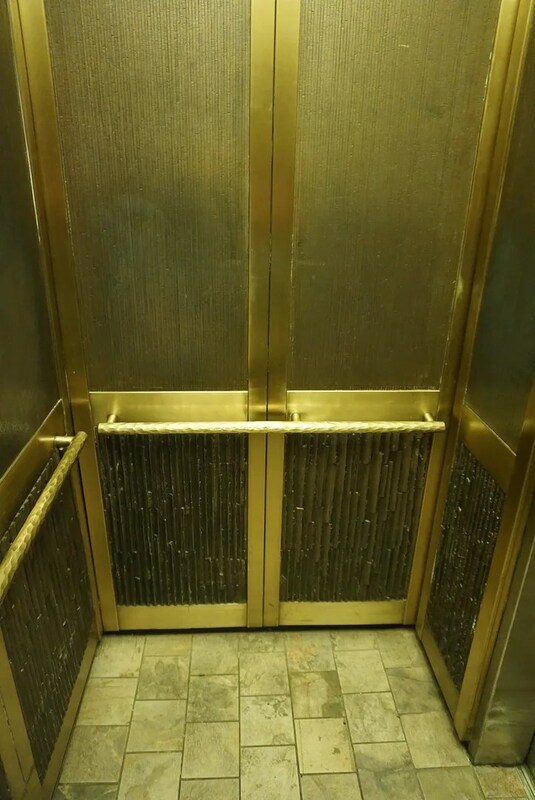 Now I’m not going to base my opinion of a resort solely upon how its elevators look but I find it hard to understand why a hotel which charges a minimum nightly rate of more than $500 (without any discounts) has one small, shabby looking elevator in each of its buildings. Perhaps they consider this part of the theming? 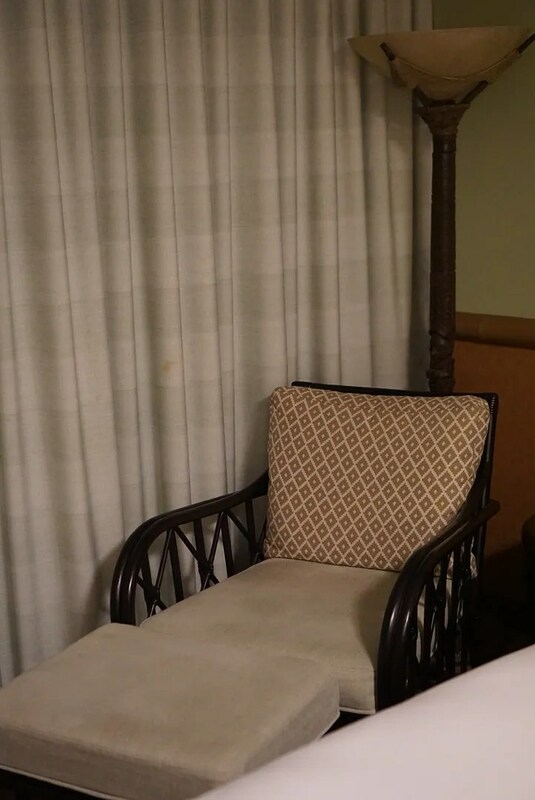 But in my opinion, at a resort that calls itself “Deluxe” and charges $500 or more per night, they could do better. 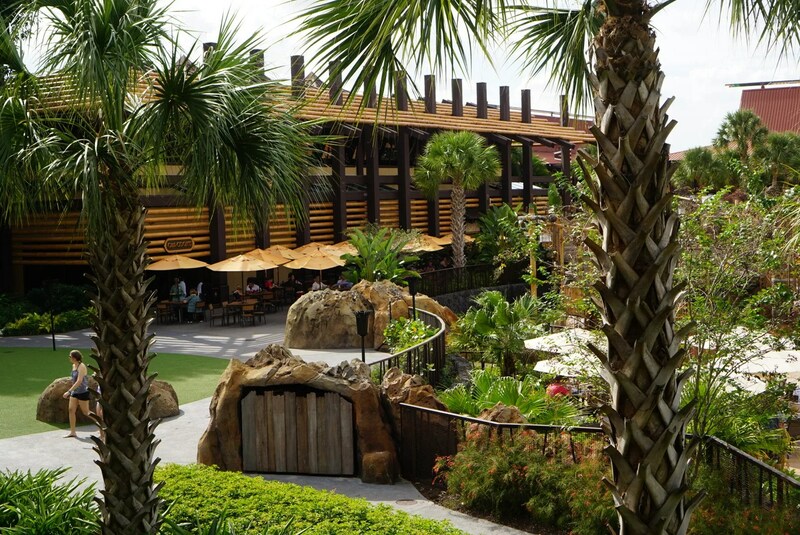 The brownish umbrellas are in the outside seating area for Captain Cook’s. 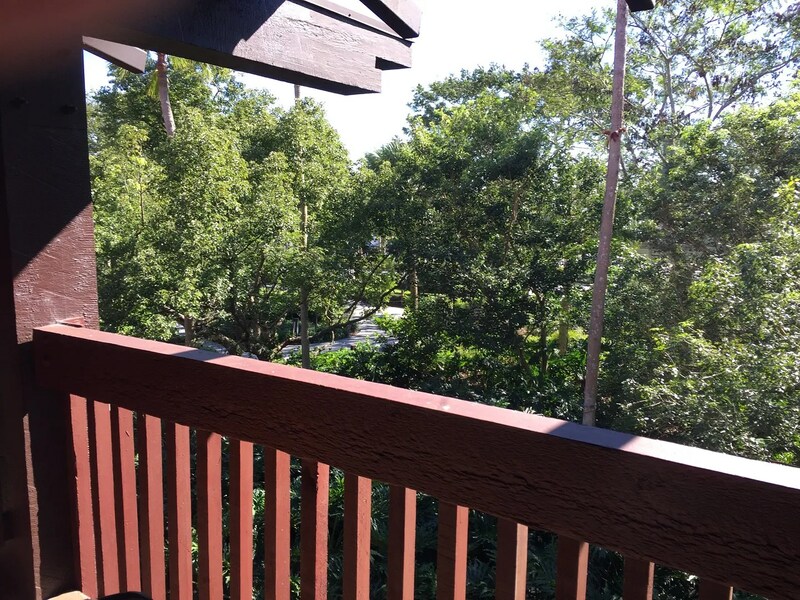 So every morning I made the very short walk to Captain Cook’s for my morning coffee to go (in my refillable mug) and two of the three mornings I also got breakfast and brought it back to my room to eat. 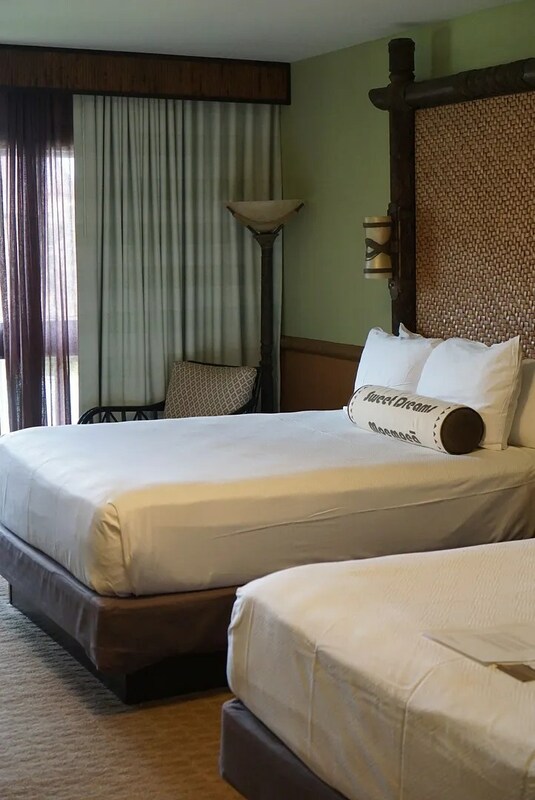 It was the same all white bedding that all of the Disney resorts have gone to (or at least all the ones I’ve stayed at on recent trips). 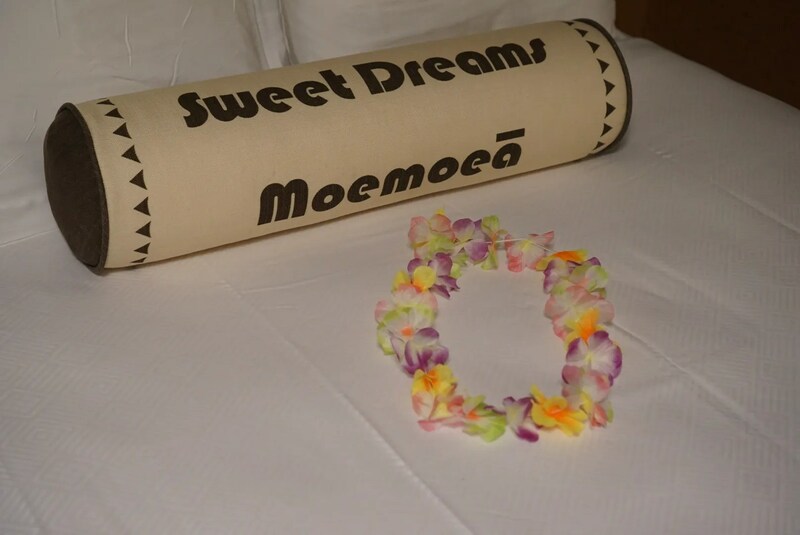 Note that the lei was not a part of the bedding décor. 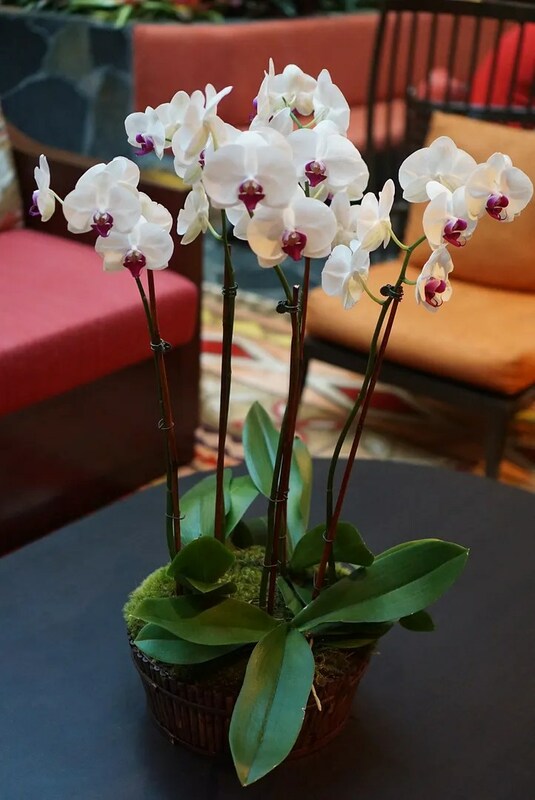 These are available to guests free of charge at the front desk of the GCH. I got mine when I had to go there to fix a problem with my Magic Band. 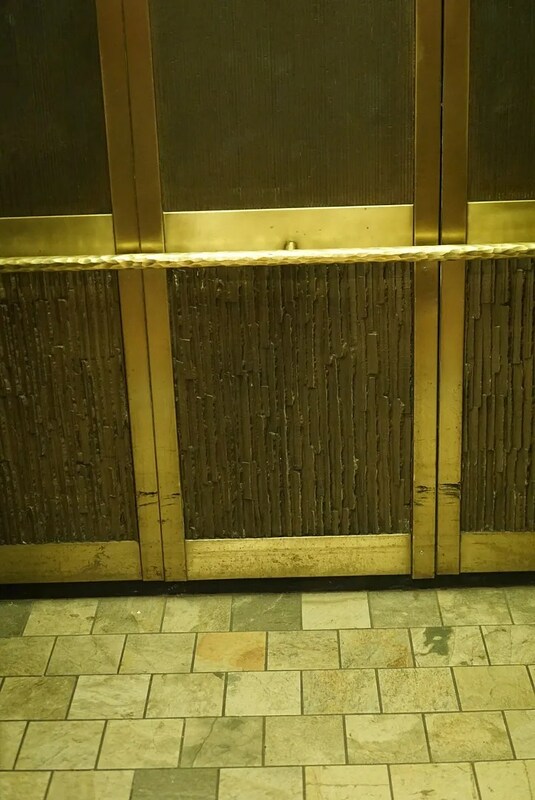 I had 4 bands on this trip (one for each of the resorts at which I stayed) and the one that I had gotten for the Polynesian did not work on my door (however the other three bands did work). Not sure why, but it was a quick fix at the front desk. I also had them prioritize my park tickets that were linked to MDE. On this trip I was using the remaining 6 days on a very old non-expiring park hopper ticket. Since I wanted to spend a few more days than that at the parks (and couldn’t add days to this old ticket), I also purchased a regular (one park a day) 3 day ticket. Since I didn’t plan on park hopping for the first 3 days of my trip, I wanted to make sure that the new ticket was used first. This is something they were able to do for me at the front desk. Last year my room didn’t have an alarm clock. 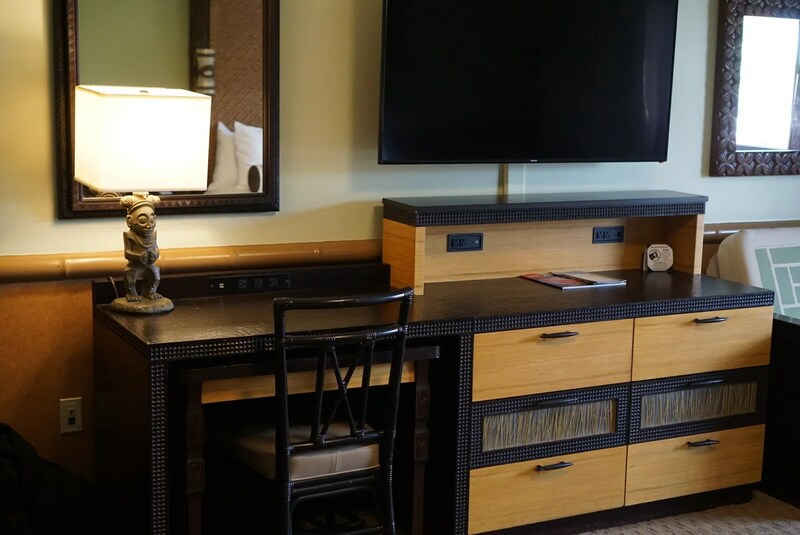 In fact I think Disney removed the clocks from all of their hotel rooms sometime back in 2016 and replaced them with USB ports/charging stations for your phones, etc. 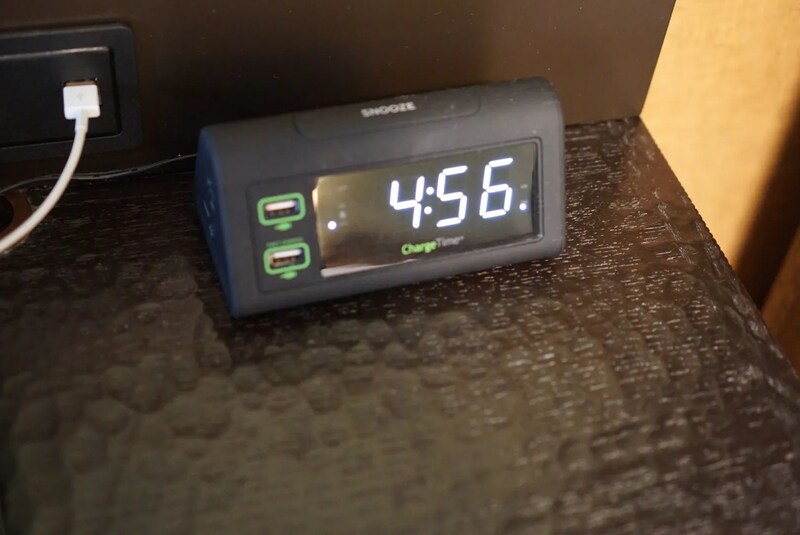 This room had both an alarm clocks with two USB ports plus a permanent strip on the wall behind the night stand which had both USB ports and regular electrical outlets. I thought it was very convenient to have both and was happy thinking the clocks had returned. 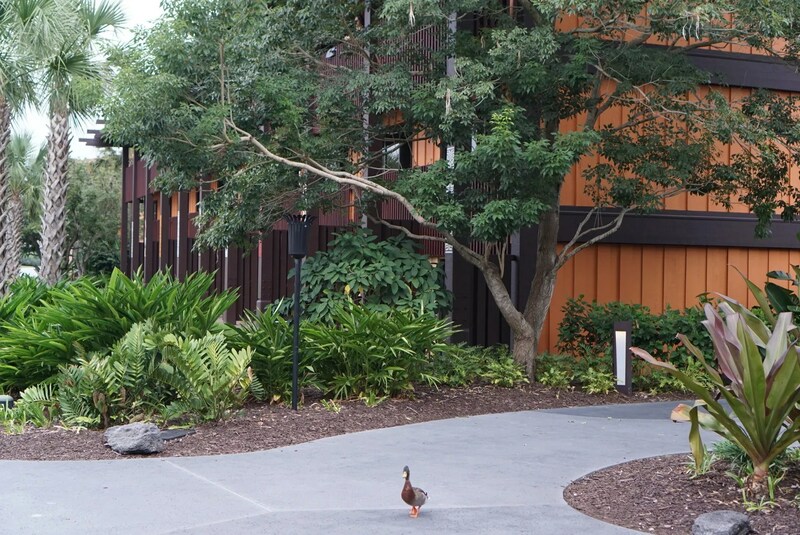 But then I found out that they were still missing from my rooms at the Wilderness Lodge, Boardwalk Inn, and Port Orleans Riverside. So that leads me to believe that this clock might have been requested by a previous occupant of my room and not removed. If that was in fact the case, it’s nice to know that they still might be available upon request. 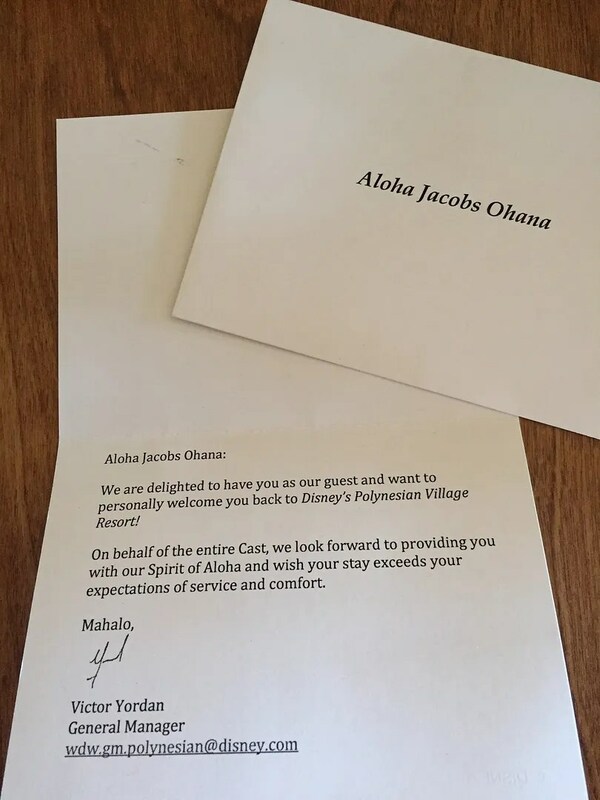 So if you are planning to stay at the Polynesian and having a balcony is important to you, be sure to request a room on the 3rd floor. While the patios of the 1st floor rooms would be okay, they are on ground level so less private than a 3rd floor balcony. I’ll mention here that the iron was really good, lol. I used the irons at all but Port Orleans and this one was the best. Since I was traveling solo this was a non-issue for me. 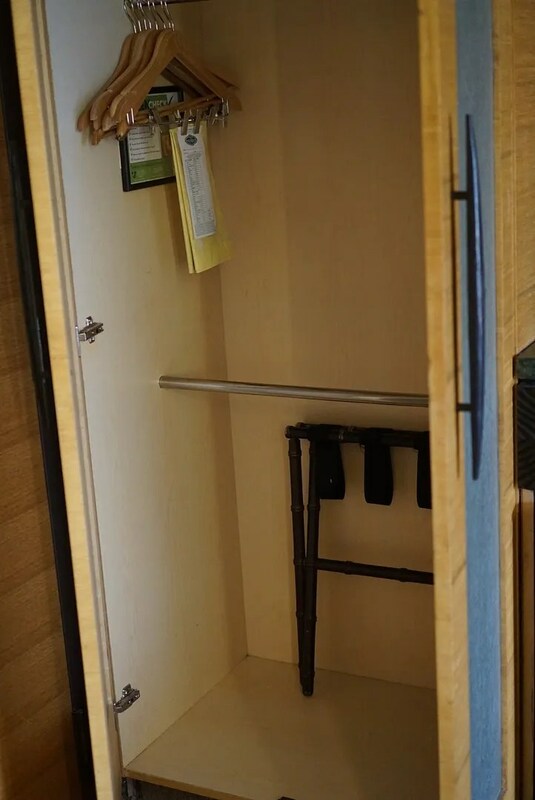 But this room could hold as many as 5 guests so having one person at a time hogging the entire one and only bathroom really would slow things down when trying to get everyone ready in the morning for a day at the parks. 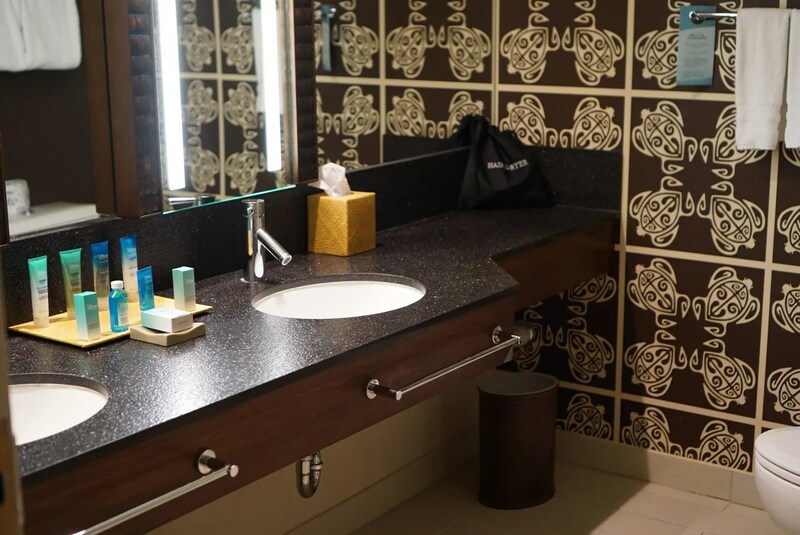 Having 3 children (all grown now) I have much experience with this and know that having the sinks located outside of the bathroom alleviates many of the morning battles. 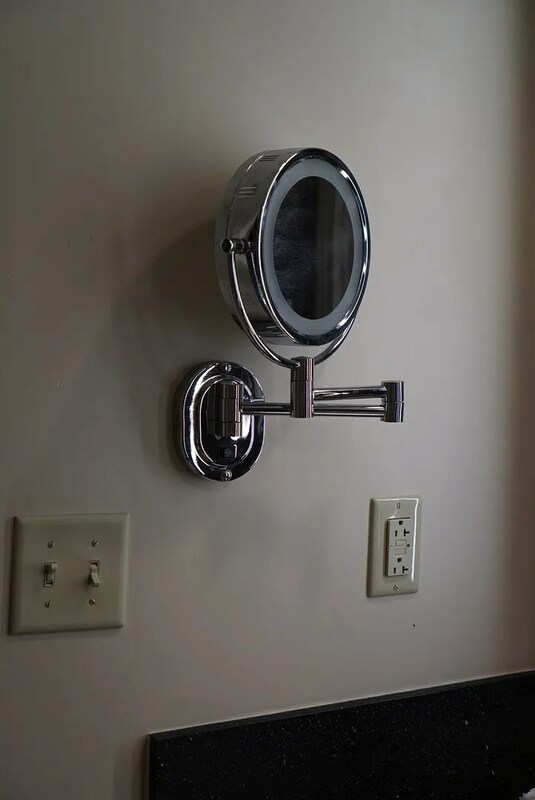 My eyesight without my glasses is not so good, so mirrors like this really help with putting on makeup, etc. 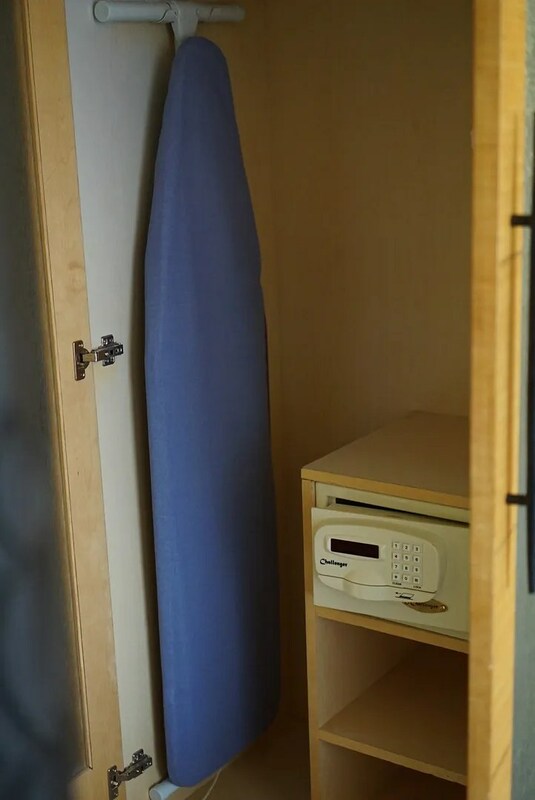 On the negative side for the bathroom though, just like last year, there is no hook on the wall next to the shower upon which to hang your towel. To reach the closest towel bar or rack you have to step out of the shower. It seems like such a minor thing but I really like to towel off first before stepping out of the warm shower. 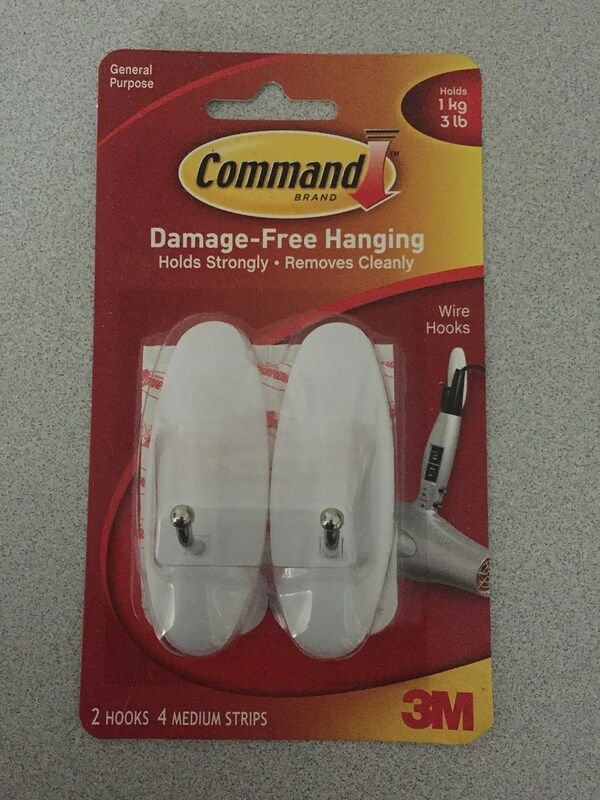 I guess the next time I need to bring one of those removable wall hooks with me, lol. 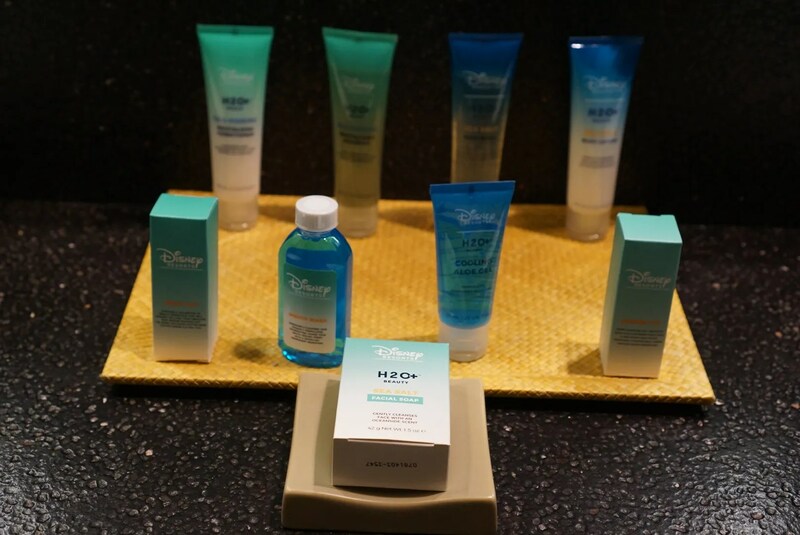 While the two other Deluxe resorts (Wilderness and Boardwalk) had all of these same toiletries, the body wash, shampoo, and conditioner bottles were all placed on a shelf inside the shower/tub…which I guess is convenient if you tend to forget to bring them into the shower with you. 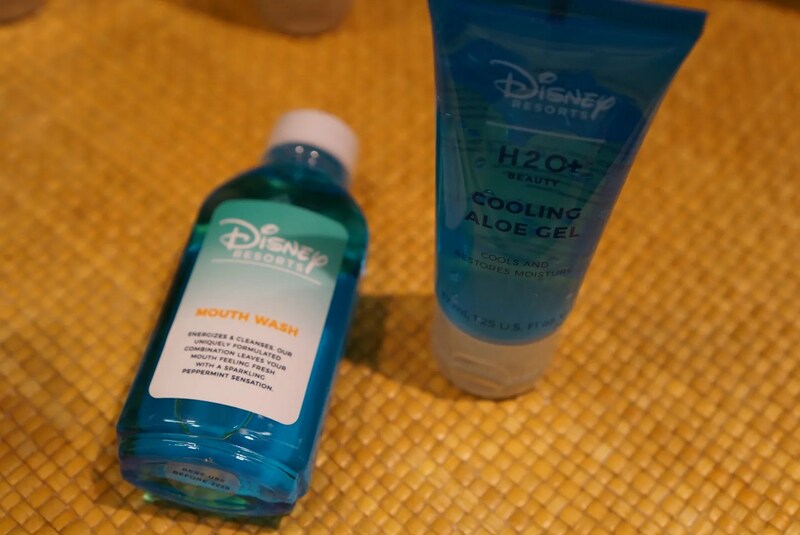 As for the Moderate resort (Port Orleans Riverside), they provided many less toiletries and the shampoo, conditioner, and body wash (while the same H2O+ brand) were not offered in small individual bottles but instead were in large dispensers installed on the shower wall. Again not a big deal, but for those of us who like to take a little bit of the “magic” home with us (take a few bottles to use occasionally at home and pretend you are at Disney, lol) it would be kind of a bummer. 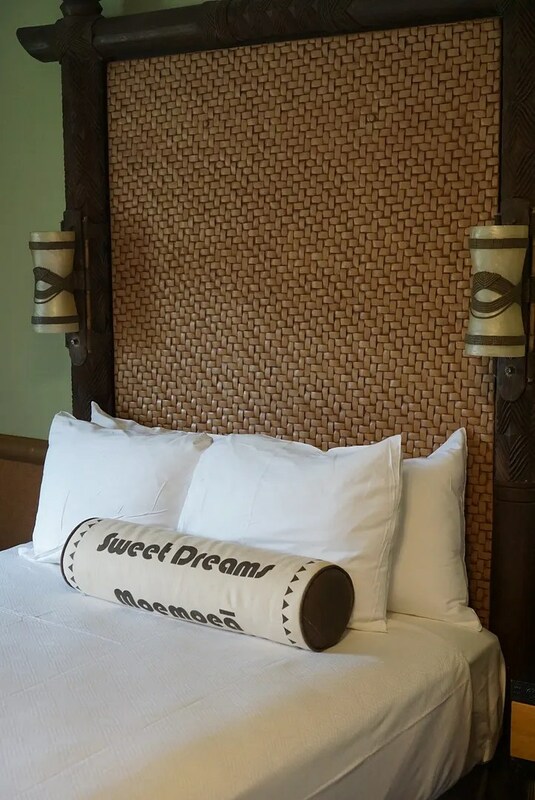 Now if only I could fit one of the friendly Disney maids in my suitcase to make my bed and tidy up the bathroom at my home everyday…oh, and say, “Have a Magical Day!” when they see you in the hallway. Wouldn’t that be great?!?! …and Captain Cook’s (their quick service restaurant) was even open 24 hours. 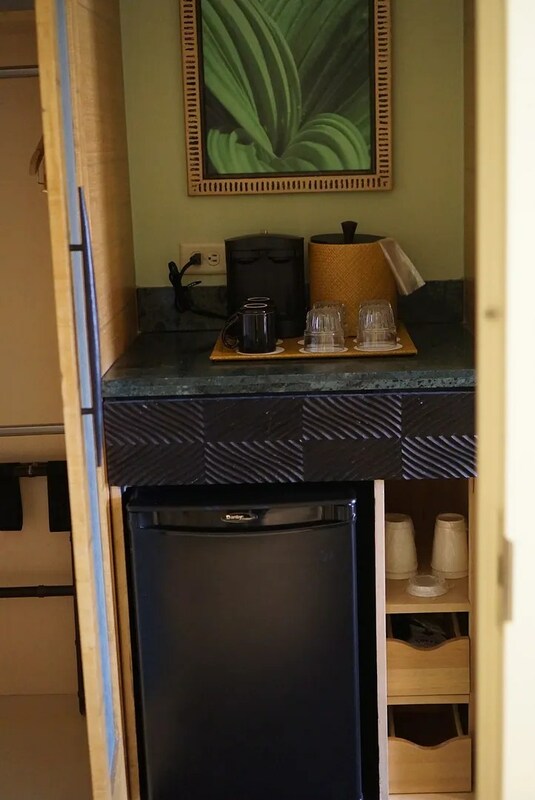 So when I returned to the resort very late one evening after attending the Mickey’s Not So Scary Halloween Party I was able to stop by and refill my mug on the way to my room. 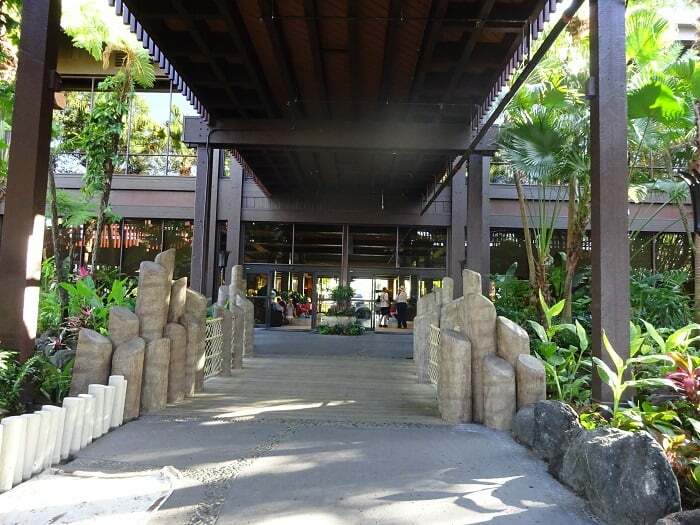 And then there’s Kona Café, one of my favorite places to have breakfast. Oh, and Pineapple Lanai for Dole Whips…need I say more?!?! 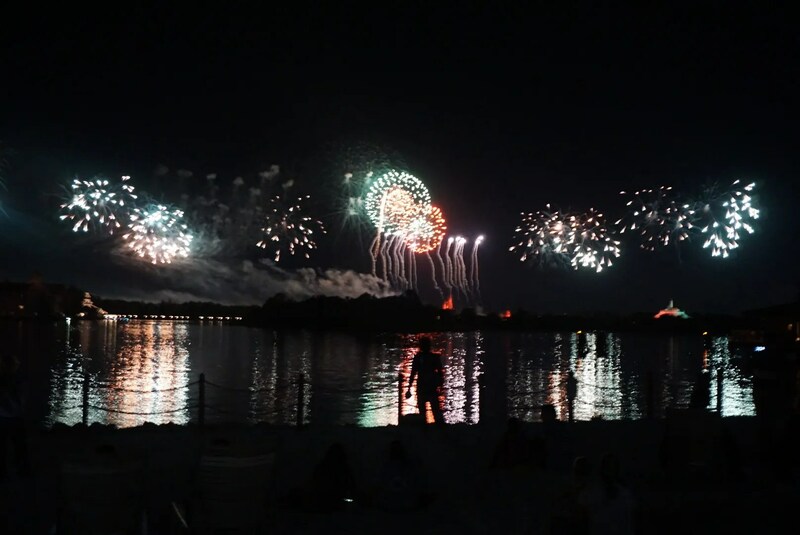 So though I still have some issues with the Polynesian, there are several things to love about it too…like watching the Magic Kingdom fireworks from the beach. So, what can I say? 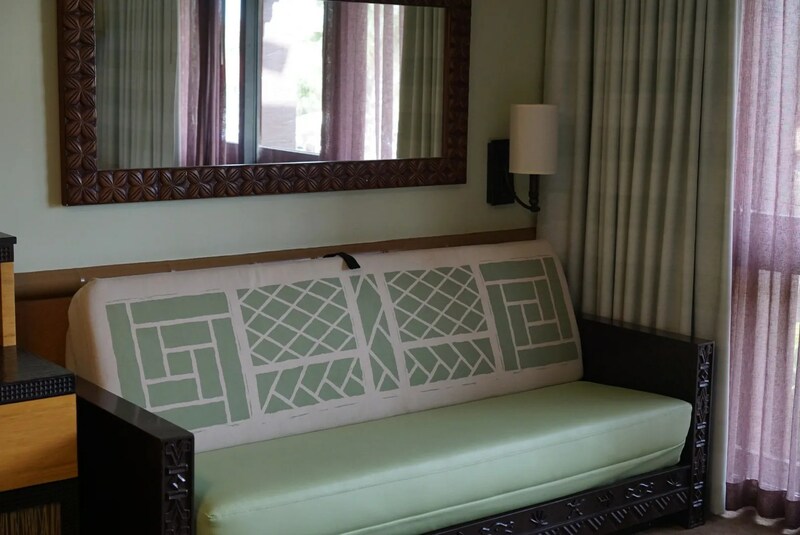 The Polynesian is growing on me. …has definitely moved up on my list!